Sarnia, Ontario, Canada, October 19, 2015 — An innovative active cooling solution for small outdoor electronics and instrumentation equipment cabinets sited in hot climates is launched today by Intertec. The company believes that its new MULTICOOL 1100 cooler is the first to feature a GRP (glass reinforced polyester) housing that is inherently resistant to corrosion – most comparable products are contained in metal enclosures that are susceptible to this problem. Offering 1100 watts of cooling power – enough to cool many types of high power field equipment – the MULTICOOL 1100 is a completely self-contained module that mounts directly on the outside wall of the equipment cabinet. It is especially suitable for cooling outdoor cabinets that are sited in hot and humid environments, and wherever atmospheric contaminants such as salt, sulfur or carbon dioxide exacerbate metal corrosion. Typical applications include temperature regulation of field-based sample conditioning and process analyzer instrumentation, and cooling the type of small distributed electronic control and monitoring systems used in many civil engineering projects. A key feature of the MULTICOOL 1100 cooling unit is that there is no direct air path between the ambient environment and the inside of the equipment cabinet. The closed loop refrigeration system has two completely separate and thermally isolated compartments, one for its evaporator, the other for the condenser and compressor stages. The evaporator is the only part of the system that is connected to the inside of the cabinet, via air ducts that are hermetically sealed to the cabinet walls, and employs fan-assisted air recirculation to maximize cooling performance. Heat is extracted from the cabinet by air flow over the evaporator and transported to the condenser via refrigerant gas. The condenser is cooled by its own separate fan, with the hot air and waste heat from the compressor being exhausted direct to atmosphere. This design approach has several important advantages. Locating the entire cooling unit outside the cabinet means that it does not contribute to the amount of heat that needs to be removed from the interior, resulting in more efficient operation and lower running costs. And because it takes up no space inside the cabinet, the overall installation can be made smaller and more thermally efficient. Another key benefit is that the evaporator compartment is fully sealed against the ingress of dust and water, preserving the cabinet’s environmental protection qualities. As standard, all cool air recirculation stages of the MULTICOOL 1100 carry an IP54 rating, with even higher levels of protection available as options. MULTICOOL 1100's housing is constructed from the same proprietary grade of GRP that Intertec uses for all its environmental protection cabinets and shelters. This inherently inert material is an excellent thermal insulator and impervious to most commonly-encountered corrosive chemicals. It has a similar strength to stainless steel but is about 75 percent lighter, making transport and installation much easier. The internal chassis and pipe-work of the cooling unit are made from corrosion-resistant 316 grade stainless steel. Suitable for use in ambient external temperatures from minus 20 to 55 degrees Celsius, the MULTICOOL 1100 measures just 75 x 52 x 25 cm (H x W x D) and weights only 38 kg. 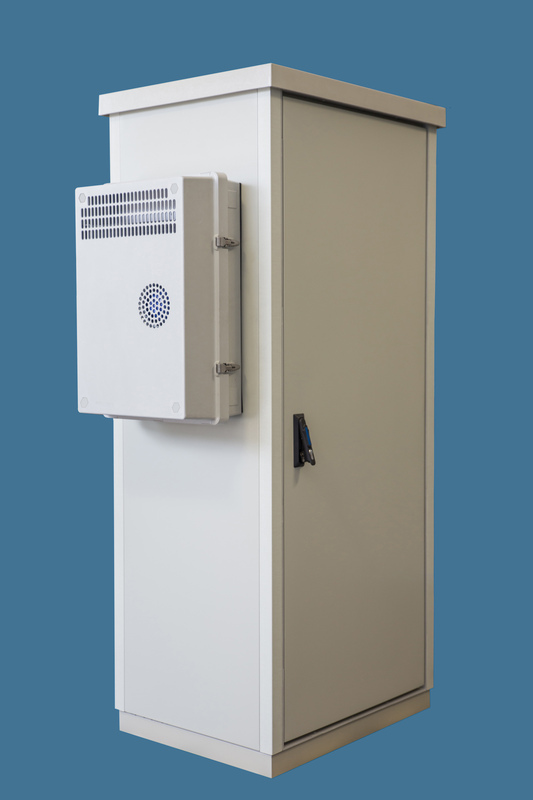 It is designed primarily for use with Intertec’s popular modular ranges of BASIC and CLASSIC freestanding outdoor equipment cabinets, and can be fitted to any size model that accommodates its 52 cm width. The cooling unit’s two-part GRP housing features a large hinged door for convenient access to all user-serviceable parts. Routine maintenance requirements are minimal – an automatic condensate drain is fitted as standard. The refrigerant is CFC-free non-flammable R134a. The MULTICOOL 1100 operates directly from a single-phase mains supply and is regulated by a thermostat that measures the air temperature inside the equipment cabinet. Cooling performance depends upon various application-specific criteria, principally the power dissipation and maximum permissible operating temperature of the contained equipment, and to a lesser extent on the size of the cabinet and the ambient external temperature range. The MULTICOOL 1100 has a cooling capacity of 1100 watts. Intertec is also developing a 2000 W version of the cooler – in the same size enclosure – for applications with higher cooling requirements. The technology is inherently scalable and Intertec is currently investigating larger models with capacities as high as 5 kW. For applications that require equipment heating as well as cooling, all MULTICOOL units can be fitted with an integral electrical heater, or alternatively the cabinet itself can be equipped with any of the company’s convection or conduction heating products. 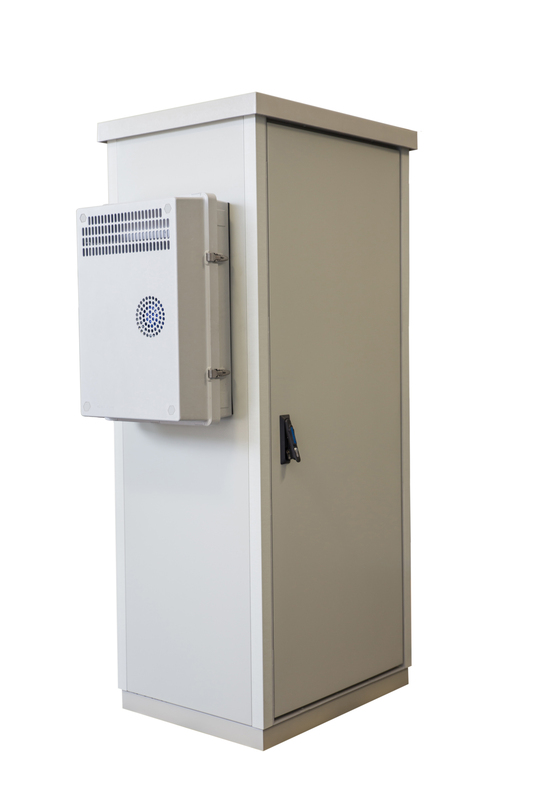 Intertec’s GRP cabinets are often chosen by system installers for outdoor applications in preference to metal enclosures, because of their superior thermal performance and corrosion resistance. 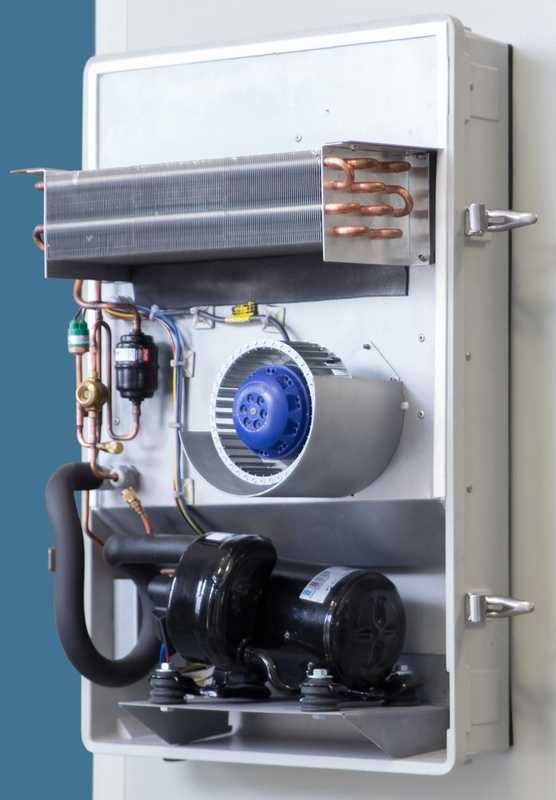 However until now, installers were forced to meet even modest cooling requirements by adapting third-party products – typically by adding metal covers to small coolers designed for indoor applications. This increased the cost of the installation and detracted from the advantage of using GRP-based equipment protection cabinets. The new MULTICOOL product line provides installers with cooling units designed specifically for outdoor use that are fully compatible with Intertec’s GRP-based cabinets. The company believes that the units’ high thermal performance and long-term resistance to corrosion will pave the way for new applications of small high-density electronic instrumentation. Its MULTICOOL cooling units are available separately or ready-mounted on equipment cabinets to further simplify system installation. For larger equipment cooling and climate control applications, Intertec produces a range of innovative GRP-based HVAC systems, as well as GRP-based shelters that incorporate passive or hybrid cooling technology. Phil Luppke, Intertec Instrumentation Ltd, 255 Henry Drive, Sarnia, Ontario N7T 7H5, Canada. Intertec Instrumentation Inc., 11116 West Little York, Building 1, Houston, Texas 77041, USA. Intertec’s new MULTICOOL 1100 active cooling unit mounts directly on the outside wall of the equipment cabinet and is the first on the market to feature a corrosion-resistant GRP housing. The MULTICOOL 1100 active cooling unit has separate thermally isolated compartments for the evaporator and condenser/compressor stages – there is no direct air path between the ambient environment and the inside of the equipment cabinet.